ANN ARBOR, Mich. - The legendary former head coach of the University of Michigan hockey team will be inducted into the U.S. Hockey Hall of Fame this year. Berenson becomes the sixth Wolverine to be inducted in the U.S. Hockey Hall of Fame, joining Vic Heyliger (1974), Willard Ikola (1990), John Matchefts (1991), Wally Grant (1994) and John MacInnis (2007). Michigan went 848-426-92 (.654) during the 33 years of the Berenson era, including the 1996 and 1998 NCAA national championships -- the eighth and ninth in school history. Berenson's accomplishments behind the bench at Michigan put him among the greatest coaches in college hockey history. Berenson retired in 2017. The 2018 U.S. Hockey Hall of Fame Induction Celebration will take place at the JW Marriott Nashville in Nashville, Tennessee, on Wednesday, December 12, at 7 p.m. The 2018 class includes Natalie Darwitz, Leland "Hago" Harrington, David Poile and Paul Stewart. 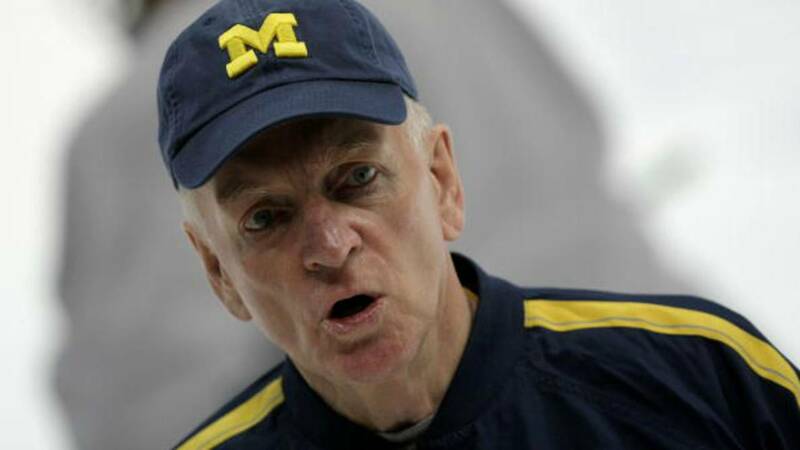 Under Berenson, the Wolverines qualified for the NCAA Tournament in 23 of his last 27 seasons. His run of 22 consecutive appearances from 1991-2012 marks the longest streak in college hockey. In that time, Michigan reached the NCAA Frozen Four 11 times: back-to-back appearances in 1992 and 1993; four consecutive appearances in 1995, 1996, 1997 and 1998; three consecutive showings between 2001-03; 2008 and 2011. Besides 1996 and 1998, U-M also reached the national title game in 2011, losing, 3-2, in overtime to Minnesota-Duluth. A three-year varsity letterwinner, Berenson is one of the top players in Michigan hockey history, earning All-America and Michigan Most Valuable Player honors in his junior and senior seasons (1961, '62). His 43 goals and nine hat tricks in his last season still stand as Michigan records. Berenson holds two degrees from the University of Michigan, his bachelor's degree from the School of Business Administration in 1962 and a Master of Business Administration degree in 1966. Berenson played in the NHL for 17 years as a member of the Montreal Canadiens, New York Rangers, Detroit Red Wings and St. Louis Blues. He accumulated 261 goals and 397 assists in 987 games -- the most career points by any Michigan alumnus in the NHL -- leaving an indelible mark on the history of the league. Following his retirement as a player after the 1977-78 season, Berenson served on the coaching staff of the St. Louis Blues and earned the Jack Adams Award as NHL Coach of the Year in 1981. Berenson continues to be involved within the Michigan Athletic Department, serving as a special advisor to Warde Manuel, the Donald R. Shepherd Director of Athletics.